If you are looking for some new online slots to enjoy this week then look at the three below and you are sure to find something that appeals. If you love fireworks and look forward to the special occasions each year when the sky is lit up with beautiful colours, then the new Fantastic Fireworks slot from IGT is the game for you. It is packed with explosive features and is sure to have you oohing and ahhing as the reels spin. Fantastic Fireworks takes place on a 5×5 grid so in that respect is more of an arcade game. When you spin the reels, the firework symbols zoom in from the bottom as if they have been launched from the ground. Behind the reels you can see the silhouette of a city and to the right is a rocket. The symbols are all different types of anthropomorphised fireworks and include red rockets, stripy blue ones, cherry shapes, purple cones, green squares and yellow faces. The wild symbol is a yellow sun, it will substitute for all of the other symbols, except for the bonus symbol, to help and form winning combinations. The bonus symbol is a white and red rocket. The general idea of the game is to create vertical or horizontal groups of matching symbols. They then explode leaving spaces on the grid for more fireworks. This process can then repeat and you can land multiple wins from a single spin. The slot also has a number of special bonus symbols that can be formed on the reels. Boom – This is created by landing a four of a kind win. CrissCross – This is created from two intersecting wins of the same symbol. Super – This is created by a five of a kind win. These symbols will then stay on the reels and move around until they are triggered by being part of a matching combo, or by being hit by the effects of another special symbol. The Boom symbol explodes all adjacent symbols, the CrissCross explodes all symbols in its row and column, and the Super explodes all instances of the most common symbol on the reels. The rocket to the right of the reels has twenty segments and these segments are filled by landing symbols holding sparklers or by landing a rocket bonus symbol. When the segments are full, there are two possible bonus features. The Free Spins awards you an initial eight free spins but four more are added for each ten sparklers collected during the round. Furthermore, special symbols are guaranteed to land on every spin. The Cannon Bonus is a picking game in which you need to select three cannons to win prizes and possibly extra picks. 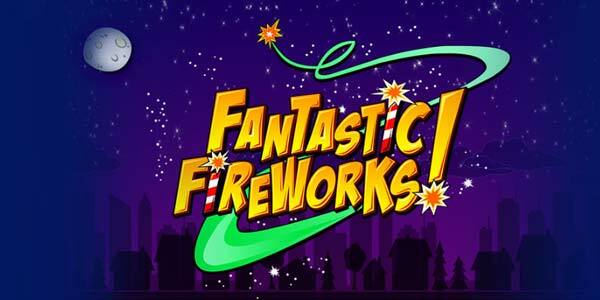 Fantastic Fireworks has a betting range of £0.20 up to £400 per spin so you can enjoy it regardless of the size of your budget. The symbols are all the same value and payout 50x for five of a kind, 10x for four of a kind and 4x for three of a kind. However, you can win significantly bigger payouts by landing chains of wins and through the bonus features. 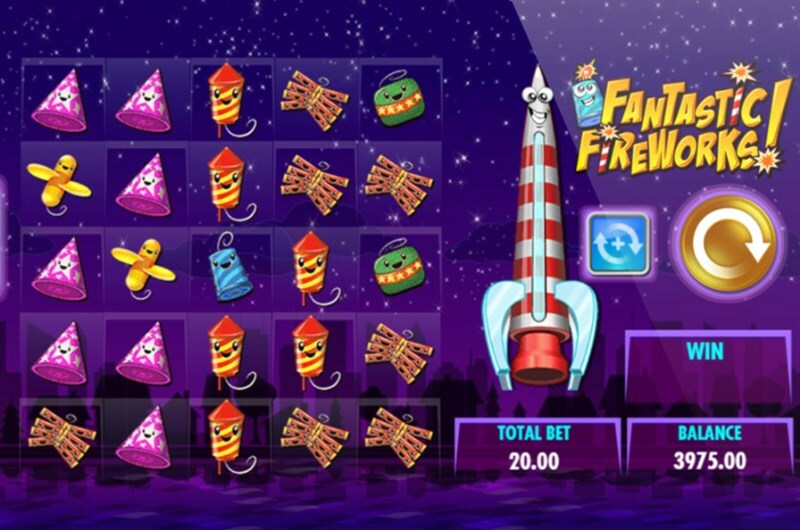 Fantastic Fireworks is a hugely enjoyable new slot and has enough features to keep you entertained for hours. Give it a try today to see some explosive wins of your own. 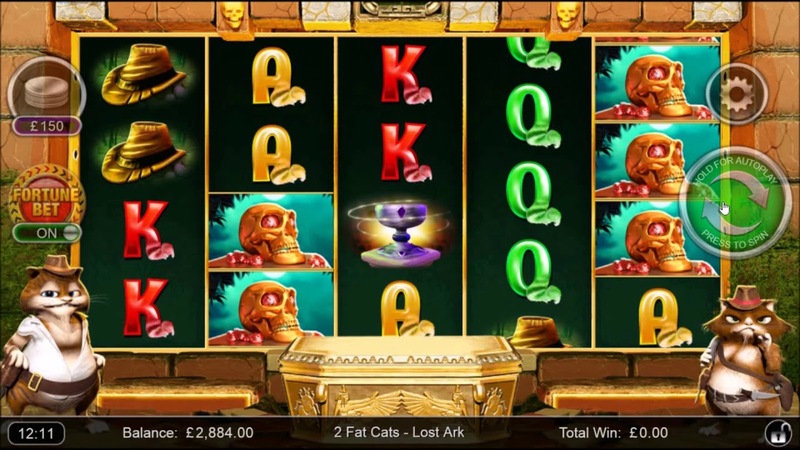 You may not think that two overweight felines are the obvious company for exploring ancient ruins and seeking lost treasures, but in the new slot 2 Fat Cats: The Lost Ark from Inspired Gaming, they can certainly guide you to some huge wins. It is a 5 reel slot with 4 rows and 20 fixed paylines. The gold-rimmed reels are in front of the ruins with the two cats (Chip and Ace) standing on each side and a shining golden ark in the centre. The high value symbols include the game’s logo, a glowing cup, a pouch of jewels, a golden skull, and a hat. The lower value symbols are the playing cards 10 through to A. There is a large ‘Wild’ symbol and it can substitute for all of the other symbols, except the scatter, to help and form winning combinations. The scatter symbol is a glowing blue gem. The slot gives you the option of turning on the Fortune Bet, this increases your wager by 50% and in return, it doubles the height of the scatter symbol to make it easier to trigger the main bonus. The main bonus, the Box Bonus, begins when the blue scatter lands on reels one, three and five simultaneously. You are then asked to pick from a number of boxes to trigger one of six bonus features. Chip & Ace – You win five free spins with sticky winning symbols. Ace – You win five free spins with wandering wild symbols. Chip – You win five free spins with extra golden symbols. If the golden symbols form part of a win the payout is doubled. Snake Pit – You play a ‘deal or no deal’ game in which you pick from baskets and accept or reject the offered amount. Golden Scratch Post – You need to find three golden paws behind three boxes to trigger this feature and in it, the cats scratch their posts to earn money until the rocks fall. Scaredy Cat – You need to help Chip and Ace across the tiles by avoiding the trap doors to win cash prizes. There is a randomly occurring bonus called the Scarab Reel Bonus. You will see the ark under the reels open, releasing green and purple scarab beetles that add themselves to the reels. The purple scarabs become bonus symbols and the green scarabs become one of the high value symbols. 2 Fat Cats has a betting range of £0.10 up to £100 per spin. There is a top payout of 500x for landing five logo symbols, the skull can payout up to 300x, the jewels can payout up to 200x, the cup can payout up to 160x and the hat can payout up to 120x. Join Chip and Ace on their adventures today and with a bit of luck you will unearth some great treasures. The orient is one of the most popular themes for online slots and now Pragmatic Play have made an excellent contribution to the genre with the release of the new Jade Butterfly slots. 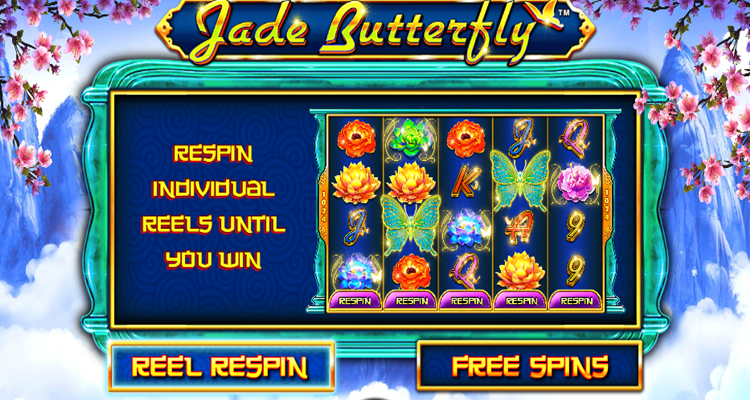 Jade Butterfly is a 5 reel slot with 4 rows and 1024 ways to win. This means that you do not need to worry about paylines, just land matching symbols from left to right across the reels to win payouts. The reels are set on a jade structure set against a background of pink blossom, and birds flying through the sky. The high value symbols are different coloured flowers, yellow, pink, red, green and blue. The lower value symbols are the playing cards 9, 10, J, Q, K and A. The wild symbol is the butterfly, it will substitute for all of the other symbols, except for the scatter symbol, to help and form wins. The scatter symbol is a golden free spins symbol. After any spin of the reels in the base game you are given the option to respin individual reels to try and land a better win, or to try to trigger the free spins if two scatter symbols have landed. However, spinning a reel will cost you money, the amount shown underneath each reel, and the greater the possible returns, the more it will cost. If you land three or more of the golden Free Spins symbols anywhere on the reels then you are awarded thirteen free spins. During the free spins any wins that you land will be tripled and best of all, it is possible to retrigger them indefinitely by landing three more scatters. Jade Butterfly has a betting range of £0.30 up to £150 per spin, so it can be enjoyed on all sizes of budget. There is a huge top payout of 4000x available for landing five yellow flowers along a payline. The pink flower can payout up to 1,200x the red flower up to 600x, the green flower up to 200x, and the blue flower up to 100x. The A and K can payout up to 80x, the Q and J up to 60 and the 9 and 10 up to 40x. This is a fantastic looking slot and the ability to respin individual reels is sure to have you hooked for hours on end. Give it a try today and enjoy the oriental adventure.